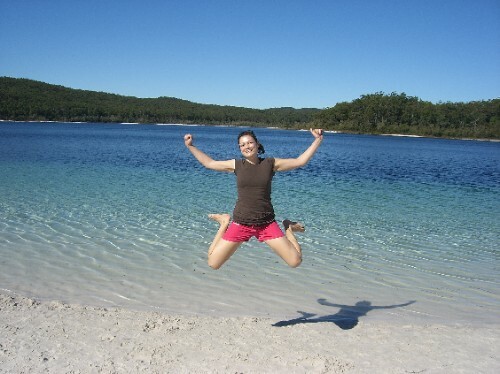 Blog from Fraser Island, Queensland | Where is the Love? After the dorm nightmare of Bunk in Brisbane we were pleased to find only the four of us in the dorm at Dingo's hostel at Rainbow beach. Not much to do today apart from our briefing for the 4x4 Fraser Island trip in the afternoon. We explored Rainbow beach which as very long and nice. We also walked up to Carlos Sand blow, spectacular and a sign of what was to come on the island itself. Merv the steriotypical Australian, and owner of the 4x4 business took us through our briefing and was very amusing, especially when a couple of french boys were not paying attention. A vital part of the briefing was informing us of how to scare away a Dingo if it comes near your camp on the island. It involved stamping your feet and shouting go home dingo. We also met the rest of our group who were great. Micky, Ruth, Jo and Tracy from Northern Ireland and Danique and Mika from Holland. Early the next mornng we headed off for the island with Drew confidently taking the wheel. Reaching the island by ferry we headed up the main road, or beach stopping at Eli creek on the way to the top. Merv had given us an itineary to stick to to avoid getting caught by the tide. When we reached the view point at the top we were a little concerned that he might have stiched us up. Hannah had by far the worst part of the driving on exceptionaly soft sand with the waves crashing in to the wheels of the 4x4 but did a sterling job getting us back to campsite 1 to set up our tents. As we had tried to stick to the timetable lunch had ben skipt so we ate that and started on the beer and goon. This continued through the night and dinner, which was rare steak, until we had made it through much of Drew's collection of drinking games. Jo also coining the phrase "git ya wee k*** s yee git" to scare away the Dingos, although it didn't work and she left Ruth all alone while at the toilet as the dingos emerged from the darkness. Another phrase that emerged that night was "consume the goon" said in a very high pitched tone when someone made a mistake at the drinking games. Unfotunately for Micky he consumed a little too much too quickly fell over the stove took a chunk out his knee and headed to bed early while the girls debated if he had actualy hurt himself or just his pride. The views on the island were spectacular during the day but at night the number and clarity of the stars was visible was breathtaking coupled with an exceptional drop in temperature. Hannah and I were woken up during the first night by the bitter wind and could strangely see the stars from in our tent. We then realised the top of our tent had blown off. Luckily it was attached by the last peg. The second day we visited lake Mckenzie, stunning, and exceptionaly cold. Beleive me when I say cold, an incredible shrinking effect. The track or road out there was through thick trees on soft sand and we needed the 4x4 full ability. We then headed back to a more sheltered campsite on the beach and cooked up a great stir fry for dinner. The second night was then very like the first especially when Micky found they had given him 90 beers too many! The last day of the trip was spent at Lake Wabby taking some photos before catching the ferry back to the mainland and Rainbow Beach. The next day we were on the bus to the town of 1770, where James Cook first landed on Australian soil in the year 1770. Emilio Hello there! Well I remember to have seen the adnesse option and I also wanted to include it in my blog but right now I am doing a third blog so I will definitely add it to that. Hopw they will pay me too after the $100.